Valentine’s Day: Oh the pressure! Valentine’s Day can be a lot of pressure, especially for someone who is crafty, loves to cook, bake and eat, and then write about what she crafted, cooked, baked and ate. Like Christmas, people wait (or at least they tell me they’re waiting) to see what I’ve produced for cards, for cookies, for meals. It’s a lot of pressure and I set the bar high for myself. Valentine’s Day also comes right on the heels of Christmas. It’s not supposed to be a huge gift-giving event, but there’s pressure to make it that way. I do try very hard to make our gifts small token gifts, a treat they want. I try not to do any candy since we get a truckload, or rather, a school busload of it at 3:30 on Valentine’s Day afternoon. Being on a budget, I struggle with what to give, what to buy, what not to buy. What I want to buy is often not what is in the budget. I’d love to say, “Instead of giving gifts this year, we’re going overnight to an indoor water park for the weekend! !” But, giving token gifts is cheaper. The indoor water park is not in the budget. Maybe next year. Since having kids, Don and I haven’t exchanged gifts on holidays. We focus only on the kids, and we figure we’re showing our love for each other in little ways all year long instead. We know our time will come around again when we’ve got an empty nest and we’ll wonder then where this time went. No matter what, they always love their gifts. I try to make my budget as equal as I can per child without spending too much more on one than another, but so they each have the same amount of items to open in the morning. 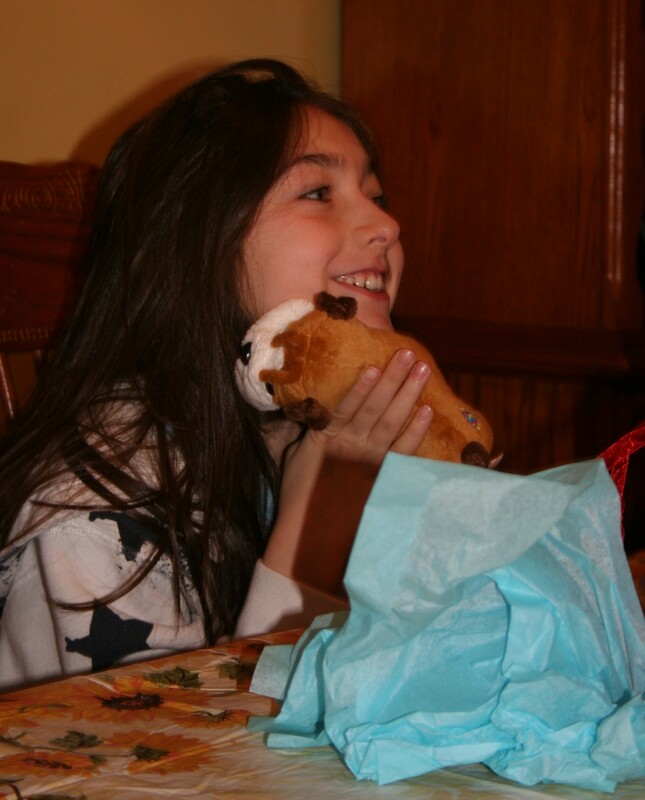 And no matter what, they always love their gifts, hopefully because I spent so much time thinking about them and choosing them. I actually don’t make their Valentine’s Cards anymore. We’re huge Snoopy fans, we had a Snoopy nursery, Snoopy birth announcements and parties when they were babies, so I have tried the past few years to get them each a Snoopy card for Valentine’s Day, to provide balance between giving them handmade items and giving them the “popular” items they also love. This year we celebrated Valentine’s Day as a family at 7:00 am since Don had a 7:30 am meeting. He also had an after school meeting and a night time meeting, so we thought we wouldn’t be seeing him at all. But, later that day, we were thrilled to find out his after school meeting was rescheduled and it meant he’d get to come home for dinner after all, and then go back for the night time meeting. So we were blessed. His 14 hour day was now only 12 hours and we’d get to spend dinner time together after all. Each year I try to think of the perfect meals and snacks to make the day special. I love hearts so I have always had tons of heart shaped items from dishes to platters to bakeware. For breakfast, I toyed with the idea of cinnamon buns with pink icing, pink pancakes or pink waffles. I looked on Pinterest and pinned a ton of things that looked great but just weren’t it. I just wasn’t feeling it, no matter what I saw. In the end, I chose to get up early and make muffins, something I used to do for them all the time when they were younger and less of them were in school. It’s a nice treat on a school day to have a hot muffin right out of the oven. I even thought of making them last night but I don’t like them when they’re cold. A little pink food coloring in them and we were good to go. I even put pink food coloring in their milk and gave them red apples for their fresh fruit. By 7:15 am Don was gone, the gifts were opened, and by 7:25 am one kid had already lost her bedtime by getting in trouble. I won’t say who or why, to protect her privacy. But that’s the way things go sometimes, Valentine’s Day or not. After School Snack: Valentine's Monkey Munch! Despite all of the pressure, I try to remind myself that it’s the little things that matter and the little things they’ll remember. I remind myself that the more I make the holiday out to be, the more of a precedent I’m setting for myself for the future. Hopefully when they think back on their Valentine’s Days growing up, they’ll think that they were absolutely perfect. Pink muffins and pink milk for my little Valentines. Everyone got a treat they'd really been wanting. 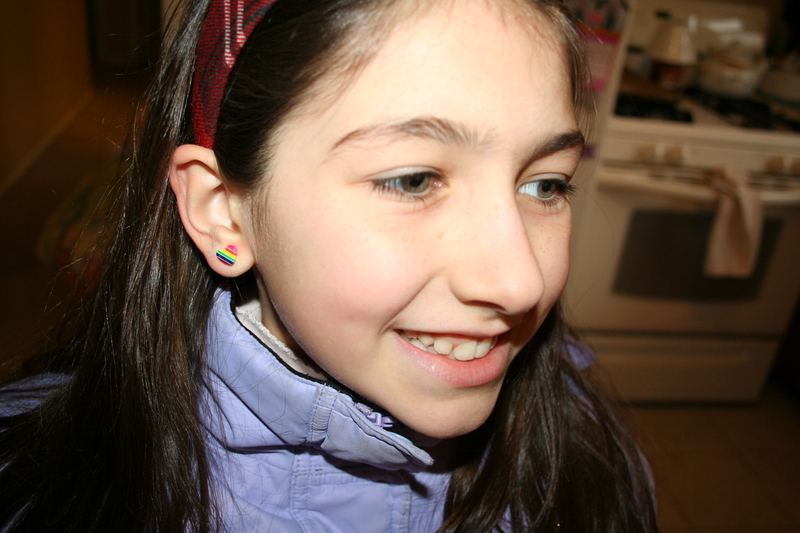 Valentine's earrings on, off to school!